BUJUMBURA June 19th (ABP) – The Second Deputy President of the Republic, Mr. Joseph Butore, received in audience on June 17, 2018, in Bujumbura, the Princess of Jordan, Ms. Sarah Zeid, who had come as ambassador of World Food Program (WFP) for the cause of the fight against malnutrition in the world. Moreover, the 2nd Deputy President of the Republic told her concretely about the initiatives taken in recent years by the Burundi government, especially the years 2013-2014, when Burundi made the decision to join the circle of countries that know the problems of malnutrition.At the end of the hearing, Mr. Butore said their talks focused on Burundi’s efforts to fight against malnutrition today. Burundi acknowledges that difficulties remain in this sector, Butore said, based on data collected by the investigators. This is a situation that does not scare the government, he said, adding that it is rather an opportunity to solve those problems and at the same time to provide the necessary response to the waiting population. “This is a question that was taken at the high level because the secretariat of this movement is based in the building housing the offices of the 2nd Vice Presidency of the Republic, which is an appropriate framework that allows us to share experiences with other countries having the same difficulties as us, “said Butore. In the second place, he pointed out, the exchanges concerned the decision by decree also taken by the Government of Burundi to launch the fortification of food, starting with the flours which, he stressed, play a very important role in nutrition. According to the 2nd Deputy President of the Republic, their talks also focused on the innovations of the “school canteens” project that Burundi, together with the WFP, initiated in the basic schools. In the past, when we talked about WFP in our country, we were thinking directly of foods coming from outside, he said, pointing out that WFP is trying to use the most of locally produced food. The idea is not simply to give food to those who do not have it, but to strengthen the economy and the circle of producers because, according to Mr. Butore, we must strengthen the circle of producers especially since every well-nourished woman who regains strength will automatically double and even triple her production capacity. According to Mr. Butore, there was also talk of the legal framework recently put in place by the government to strengthen solidarity between the Burundian citizens. 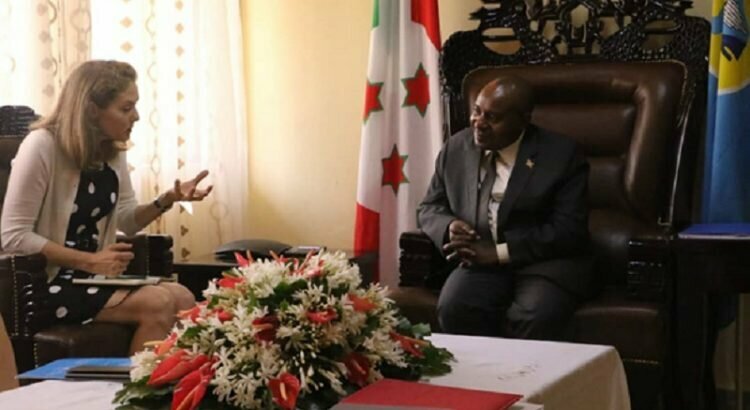 “We are focusing on local solidarity first and foremost, and it is in this spirit that the Burundi government has put in place a decree that allows Burundians to help each other. Burundi has recently put in place a multi-sectoral action plan that will enable the Government of Burundi to tackle these problems one by one and achieve, by 2030, this well-being for women, children and youth, Butore said. Note that Princess Zeid was accompanied by the WFP country director in Burundi, Ms. Virginia Villar Arribas.